The so-called "wild mustang" is actually a feral domesticated animal, with an interesting history behind its existence in North America. 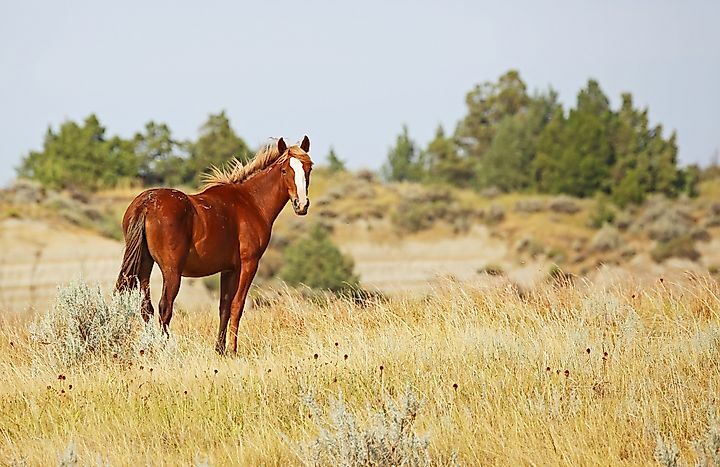 Wild Mustangs are descendants of domesticated horses that escaped from early New World settlers. The American Mustang is a large mammalian animal that stands on all four legs, even while it is resting. Like other horses, the mustang has hooves, a low set tail, an elongated head and neck, and short, pricked ears that are set at the top of the animal’s head. The animal’s hooves feature only a single, external toe, evolutionarily developed over time from multiple toes, which lie inside the thick nail covering. The mustang is covered in short hair with the exception of its hooves, with longer hair growing as a mane on its long, muscular neck, as well as on its tail. All mustangs, and horses in general, have incisors and hypsodont teeth. Only male mustangs have canines. Their eyes are large, and set on either side of the head of the animal, which allows for improved peripheral vision. Mustangs, like other horses, are grazers that primarily eat a diet of grasses. Their hypsodont teeth within their cheeks allow for complex grinding of tough plant matter. The mustang is a migratory mammal, grazing on available grass, hay, and other vegetation as it comes upon it. The mustang was traditionally a free-roaming animal living across the expanses of the Great Plains of the United States, and a descendent of European horses accidentally introduced to the New World. Specifically, the modern day mustang descended from escaped domesticated horses brought to America by the Spanish in the late 15th Century. It is often said that Columbus was the first person to introduce horses onto American soil. As such, the mustang is little different from the domesticated horses used by the Spanish explorers and conquistadors of his day, other than being feral. As such, Mustangs are not considered as being truly "wild", but instead they are classified as "feral domesticated horses". While the original mustangs were descended from Spanish breeds, modern day mustangs are an amalgamation of various common breeds introduced into the wild. It is believed that between 2 and 4 million mustangs existed in the Great Plains of the US by the 17th Century. Currently, only about 20,000 exist in the Southwestern US. The etymology of the word “mustang” reveals a part of the animal’s nature. “Mustang” is derived from the Spanish words, “mostengo,” and “mostrenco,” which mean “masterless cattle.” The mustang’s natural behavior no different than that of the common, domesticated horse, other than not being reined in by human masters. They have a strong "fight-or-flight" response, which can result in aggressive or otherwise frantic behavior when they feel threatened. As they have descended from various domestic horse breeds, they have been successfully tamed by people as their original progenitors were. It is said that the mustangs were successfully tamed by Native Americans living in the Great Plains, and quickly became an essential part of their buffalo hunting and warrior cultures. In current times, mustangs have been adopted as pets and for use by recreational riders. In 1973, an "Adopt-a-Horse" program in the Pryor Mountains of Montana began placing mustangs as pets into homes and farms. While they required experienced handlers, most mustangs soon adapted as well as any horse bred on a farm from birth. As mammals, mustangs give birth to live young. Gestation lasts approximately 340 days, and horses typically give birth to a single foal, with twins being rare. As they are a precocial species, foals often begin walking and running shortly after birth. For the first 4 to 6 months following birth, foals drink milk provided by their mothers, after which time they become weaned. Typically, mustangs give birth in the spring. Mustangs are capable of reproduction after reaching sexual maturity, starting approximately at 18 months of age. Physically, however, they only reach maturity in terms of adult size at around four years of age.